It was about 10° F when Leonard and I headed off to Baum Lake (Shasta County CA) yesterday morning. I was not certain how active the wildlife would be, so was pleasantly surprised to count 32 different bird species – great considering that many of the “good” birds have not even returned yet this spring. Species are always migrating in, out and passing through, so we enjoy the great diversity. A medium-sized duck that is usually not abundant in our area, but that we do occasionally see, was swimming about on a little pond near the lake. That lone male Barrow’s goldeneye (Bucephala islandica) was the only goldeneye I was able to find yesterday. Goldeneyes do not breed in our area so I expect this male, already in his courting finery, will be heading north very soon. Very similar to the common goldeneye, the male Barrow’s goldeneye is distinguished by a crescent-shaped white spot at the base of the black bill. The crescent is thinner at the top and thicker at the bottom. The belly, breast and sides are pure white while the head and back are black. A line of black extends into the white breast. White “squares” follow the wings. As befitting a duck called a goldeneye, the eyes are yellow. Breeding males have a purplish cast to their head. Barrow’s goldeneyes are diving ducks that survive on aquatic invertebrates, fish eggs, small fish and aquatic vegetation. Although Barrow’s goldeneyes are generally considered a northwestern species, there are breeding colonies in Iceland and along the seaboard in northeastern Canada. Interestingly, as the species name suggests, the bird was first described in Iceland. 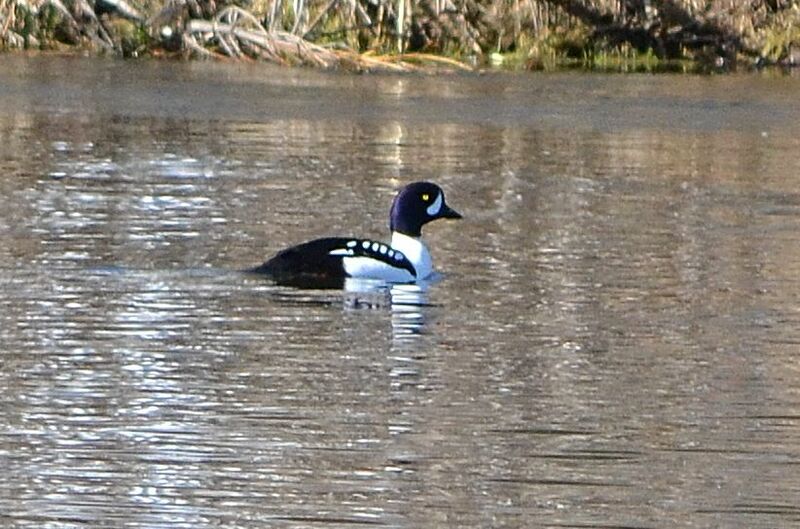 This entry was posted in Birds and tagged Barrow's goldeneye, Baum Lake, Bucephala islandica, nature, Shasta County. Bookmark the permalink. this is so special Chris – we were over there the other day and saw this lovely duck – I had no idea what kind it was. even got a ‘bad’ shot of it just to try and identify it. I’m fascinated that you saw 32 different species – I need to ‘step it up a notch’ and be more observant – like maybe I see 3!!!! thanks for sharing this great blog! Thanks, Susan! Some day we will need to explore Baum together.